There’s a weird mesmeric quality to Goodluck Jonathan’s ‘This Is Our Way Out’. Compiling the three EPs they have released into a full album-sized tracklisting, they blend the tropes of indie rock with a bleak, almost apocalyptic artistry that turns them into the post-rock driven shadow twin of Max Raptor. Opener ‘Bruises Fade’ is a claustrophobic, ominous forest of dense guitars that ring out, dogged by fuzz and thick bass as piercing cymbals rule above them. The bleak, atmospheric melodies layer upon one another, breaking into tense and sparse verse moments, as the indie rock vocal style is transformed via hushed, intense delivery into a nightmarish narrative, and a pummelling chorus chased by a dizzying spoken word and instrumental ending hammers home this track’s status as one hell of an opener. ‘Stranded’ is a plaintive, captivating song, with keening guitars swirling around a savage percussion attack and hypnotically expressive vocals that are layered upon one another, making the verses resemble listening to someone talking as well as their inner thoughts. Atmosphere reals again in the hazy guitar labyrinths of ‘Away From Here’, a beautiful shoegaze cut. ‘Broken Heart’ is possessor of a phenomenal instrumental opening, all tense chords on the guitar, a creeping riff, and a sporadic explosion of bass and drums that drop to… quietness. 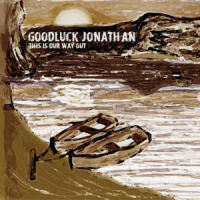 Goodluck Jonathan are doubtless masters of dynamic manipulation, and the gradual buildup of the track backs this up, as we are slowly pushed from bare-bones vocals and atonal strumming and bass into a halting attack into a full barrage, all done with tight aplomb and a startling, dark lyricism. ‘Fatman’ equally taps into their fascinating, unnerving lyrical ability as the ghostly vocals sing out lines in a way that makes them feel pulled out of the very soul, and the tribal rhythms of the echoing guitar and metallic-punk drum attack made me go and look up whether or not this was a well-disguised Cult cover – it’s not, but the narcotic, fascinating style of songs like ‘Spiritwalker’ and ‘Phoenix’ are at play, reprised in the tribal war beat of ‘Backs To The Wall’, which falls somewhere between Max Raptor and Theatre Of Hate in its savage yet sickly romanticised bleakness. ‘Light Burns My Eyes’ is an eerie yet heartfelt song, the guitar melody approaching classical in its shape and patterns, and the whole affair overshadowed by a chilling electronic wail. As it builds to a rocky, almost metallic climax of squalling Fugazi-esque climax before falling again, I feel played with, but in the manner of a deer in headlights, I am compelled to stay for the thundering bassy distortion of the chorus and the spectral retreats of the track’s landscape as it heads to a lurching, sneering buzzsaw guitar and reverb-created vocal howl and a melancholic ending. Contrasted to all this shoegaze/post-rock madness are moments of familiar indie rock: ‘Fall Of America’ is almost A Place To Bury Strangers via Arctic Monkeys or even The Cribs, with its accessible and almost catchy heart behind the ethereal exterior. Similarly, ‘Mad Licks’ combines a phantom-riddled enigmatic chorus of fuzzy atmosphere and gentle, mournful crooning to a punky machine-gun chorus riff. Penultimate ‘Stop’ is a seething, angry stormcloud of a track, with chaotic tumbling guitars, bassy heat, and a clattering, aggressive drumkit. The vocals drop melodicism for bile, and the musicianship reaches fever pitch with savage intensity and flick-knife speed, moving from sneering cool to frenzied riffing to a tumultuous bass synth maelstrom with no hint of anything other than grace and tight aggression. To cool off, we have the title track: ‘This Is Our Way Out’. A monologue is backed by atmospheric synths and a bass drum heartbeat sound. The result is a dramatic, elegiac track that truly brings closure to this work of artistry. I’m going to say, Goodluck Jonathan will inevitably divide people. The vocal style is very take-it-or-leave-it, trying to blend cool and indifferent with genuinely evocative words and music. But oh what words and music this is! A heady blend of concise song construction, real tightness, emotional impact, and sonic mesmerism, ‘This Is Our Way Out’ is a dark trip to the end of the tunnel, the soundtrack to what is a bleak time that is both accessible and awe-inspriring.